Drift Barn Cottage01263 513765work Self-cateringDelightful restored Norfolk brick & flint holiday cottage, forming part of small complex of 3 holiday units. Own private grassed courtyard garden & generous seating area. Two miles from the seaside resort of Cromer. Offering picturesque views, great walks to Felbrigg Hall and Cromer. This self catering property is ideal for family holidays. Sleeps 8 - four bedrooms. 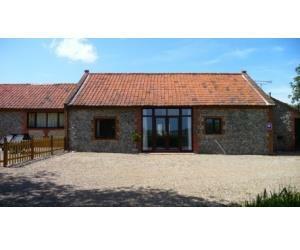 Delightful restored Norfolk brick & flint holiday cottage, forming part of small complex of 3 holiday units. Own private grassed courtyard garden & generous seating area. Two miles from the seaside resort of Cromer. Offering picturesque views, great walks to Felbrigg Hall and Cromer. This self catering property is ideal for family holidays. Sleeps 8 - four bedrooms. Parking for 2 cars outside property. 2 Ground Floor Bedrooms. Flatscreen TV and Blu-ray DVD Player. Washing machine and Drying facilities available on site. Private garden with decking and lawned area. Situated right on Weaver's Way foothpath with direct walks into Cromer or Felbrigg Hall. Children welcome from any age. From the A148 from Holt, carry on through village, keep on this road and turn right signposted Felbrigg. Past Felbrigg Hall gates, there is a bend and Drift Barn Cottage is on the left hand side down the long shingled drive.